Back in the 1950s there was a men's hair styling product sold in Britain under the name 'Brylcreem', a precursor to hair gel. It was a fashion item, and by the 1980s when I worked for the then manufacturer, Beecham, sales in the home market were in decline. But an article on the product in the company house magazine of the time explained that there were still some sixty or so countries where Brylcreem had still to be launched in, and so production was expected to be maintained at existing levels for many years to come. I was reminded of this 'phased rollout' the other day when I saw the recently updated EMEA Mobile Market Opportunities Wall Chart, which maps mobile penetration graphically from South Africa through to Scandinavia, as well as providing supporting mobile subscriber numbers by operator across the region. What the chart highlights are the markets in which the mobile phone has yet to triumph. Countries that have a coast line are clearly benefiting from the submarine cables that now pass down the east and west coasts of the continent. Countries with a coastal landing station are fostering burgeoning mobile markets, whilst the landlocked nations in the centre of Africa have still to feel the benefits of the mobile revolution. There are some exceptions to this: there's a small group of countries made up of Guinea-Bissau, Guinea, Sierra Leone and Liberia on the western tip of Africa that are still low in the mobile penetration stakes. Niger and Chad suffer from their geographies on two counts: their northern territories take in the Sahara, and are reliant on neighbouring nations for terrestrial fibre optic cable connectivity. The Central Africa Republic is both remote from the sea, and has also recently suffered a regime change, which is never good for long-term development of strategic infrastructure. The Democratic Republic of the Congo (DRC) does have a sea coast. It also has - belatedly - an operational landing station. But this highlights a problem with 'national' mobile penetration data, in that it does not reflect the concentration of both population and resources. In reality areas with 'good' mobile coverage are between the coast and the capital, 93 miles up the Congo River, and in the southern areas where the mining communities have encouraged network providers to expand. But the eastern tracts of the country feature broken roads, docks and railways abandoned when Belgium opted out of being a colonial power. Somalia - as the Kenyans know only too well - is a country of great untapped potential, as it has a long coast, which should be facilitating something of a broadband revolution. Instead the country is rocked by another kind of revolution, although their are now grounds for optimism. The spilt of South Sudan from Sudan has left the northern area with a strong mobile market but no oil, and related forex issues, whilst South Sudan has the oil but lacks infrastructure. This includes the obvious ones of road, rail and telecom links, as well as the essential outbound pipeline. However these matters are being addressed. The Middle East (the chart includes Turkey in the region) again shows hotspots, although here oil has greased the telecom wheels so to speak. Yemen, Syria and Afghanistan stand out as markets where penetration has yet to match that of their neighbours. Iran - despite trade restrictions - is already a large mobile market, as is Turkey. Some years ago someone said to me that after Africa, it would be the 'Stans' that would be the true 'last market' for the mobile phone to conquer. 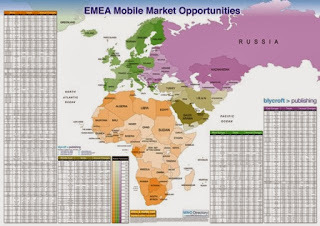 And EMEA Mobile Market Opportunities Wall Chart does indeed confirm that in 2013 Azerbaijan, Krygystan, Tajikistan and Turkmenistan are still awaiting their Prince Charming to wake them from their low penetration slumber. Details of the EMEA Mobile Market Opportunities Wall Chart are here.